The arts and crafts on display. This small market carries a range of local and imported Haitian arts and crafts. The small yet colourful Alverna’s Craft Market is found on Dolphin Drive (incorrectly labelled as Allegro Road on many maps) and near the Graceway Gourmet supermarket plaza in Grace Bay. Alverna’s Craft Market features tiny octagonal craft huts, and is one of the oldest tourist-oriented shopping sites on Providenciales. 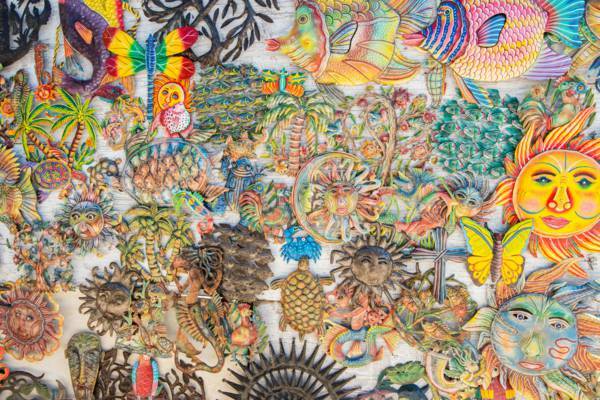 Many of the items offered for sale here are handmade items from Haiti, including sheet metal art that's either bronzed or brightly painted, jewellery, and hardwood carvings. Much of the art and souvenirs at the market are handmade and unique, yet are sourced from the neighbouring nation of Haiti and are not created in the country. This isn’t necessary a bad thing, as such souvenirs are definitely an improvement over the re-branded and mass-produced Asian trinkets common to many Caribbean destinations. Authentic Turks and Caicos gifts are available at some shops, yet they tend to be harder to find, especially if you’re not sure what to look for. Local gifts tend to reflect past industries in the islands. Woven bags and doll crafts are derived from the basket making industry, and the model sailboats offered today were once used as the beginning templates for building a Caicos Sloop. You’ll also be able to find Turks and Caicos conch shells, as well as trinkets and jewellery made from the shells. Also onsite at Alverna’s Craft Market is Turks Kebab, the island’s only kebab restaurant. It’s quite easy to get to this complex, which is found on the southern end Dolphin Drive (Allegro Road). If you’re on this road from the Grace Bay side, simply continue past the entrance to Ports of Call Resort and Graceway Gourmet for about 1000 feet (300m). Nearby is the Grace Bay branches of Scotia Bank and Avis Car Rentals, as well as Neptune Plaza and Grace Bay Medical Centre. Last reviewed by an editor on 13 April 2017.